Remains of a missing World War I soldier were discovered last week near the Ulster Tower memorial on the Somme battlefield. They were found as a mechanical digger was operating as part of plans to improve the parking area and provide a cobbled pathway from the Tower to Connaught Cemetery and Thiepval Wood as well as to widen the roadway. Soldier’s equipment and what appeared to be human remains were spotted, the Commonwealth War Graves Commission (CWGC) was notified and all necessary steps put in place to recover the remains. 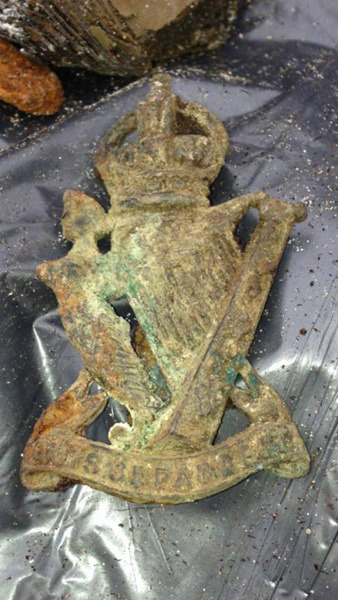 The Western Front Association suggests the soldier may have been a member of the Royal Irish Rifles – the regiment’s cap badge was among the remains recovered (pictured above). There is more on the story on the WFA site, here. This entry was posted in Events and tagged 1916, Centenary of World War I, Connaught Cemetery, CWGC, First World War, missing of the Somme, missing World War I soldier recovered, Royal Irish Rifles, Thiepval Wood, Ulster Tower, World War I. Bookmark the permalink.